The patera is an all-purpose mess pan, for cooking, eating, and probably drinking. 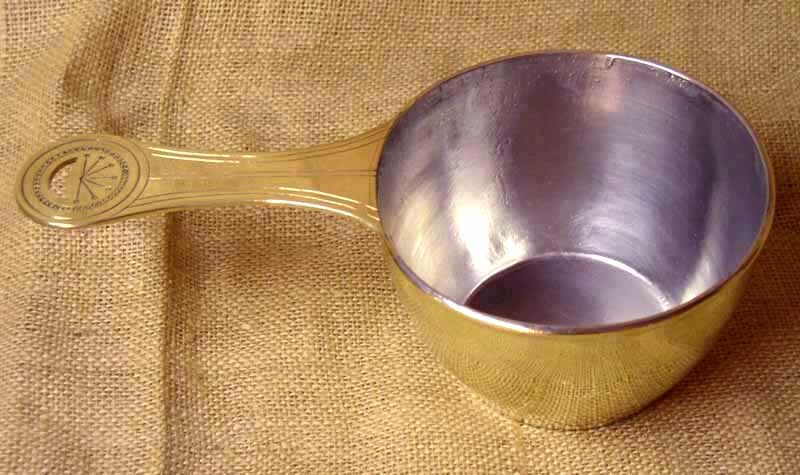 It was made of bronze (brass may be used instead), and was apparently often spun from a blank which included the handle. Some examples do have handles added on in various ways, and some are hammered. The patera can be the "simple" style with a flat bottom and fairly straight sides, or have base rings cut in on the lathe, both to counterbalance the heavy handle and to distribute heat while cooking. Either type can be from 4" to 8" in diameter. The cookpot or bucket (vas or situla, etc.) came in a variety of shapes and sizes, about 5" to 8" in diameter by 7" to 10" tall. The handle could be attached by 2 riveted loops or by means of a heavy wire with loops in it around the rim of the pot. The patera at left is of the straight-sided type, lined with tin. The situla at right is also tin-lined. Several iron flasks with bronze fittings have been found. At least one of which has a locking cap, while another has enamel decoration, so it is not certain that these were general-issue items. The seem to hold a quart or more, the example from Newstead measuring 5-3/4" in diameter by 4" wide. A number of ceramic flasks of similiar shape and size have been found, which may have been canteens though they generally seem to be rather thin and fragile for that. Some are cylindrical like the iron flasks, others are lens-shaped in section. A few have loops at the top for a cord, but otherwise could have been carried in the net bag. They are reddish or gray in color, and some are decorated with concentric rings, or rings of raised dots. Bear in mind, however, that none of these flasks has been conclusively shown to have been a canteen--they could easily be for carrying bath oil! Another good possiblity is that a leather flask was used to carry water, and carried in the net bag. Experiments with animal bladders have been less than successful, since they are delicate and tend to become brittle. Simple cylindrical drinking cups are fairly common finds, perhaps 2-1/2" in diameter by 4" tall. Other types of cups based on original examples may also be used. 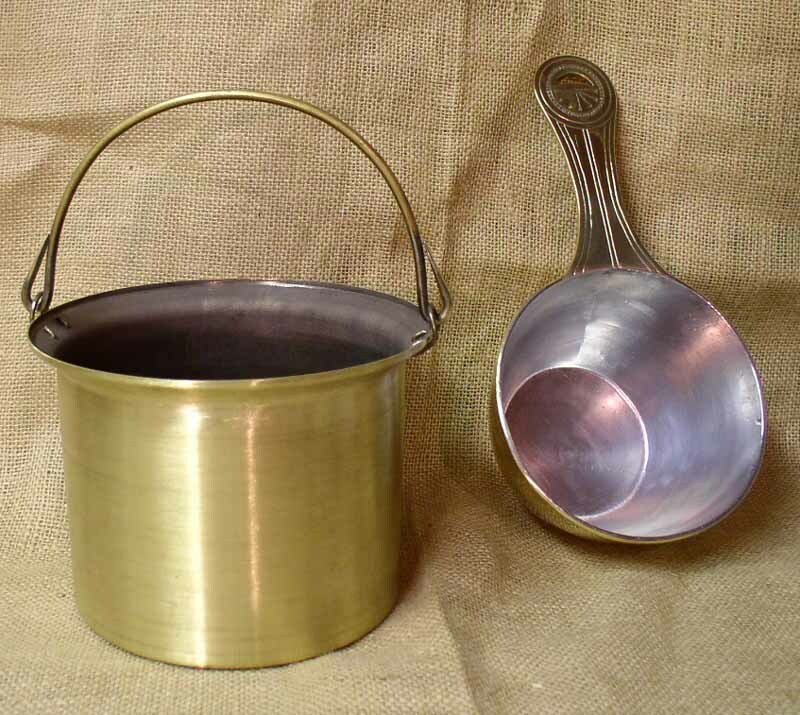 Mark Morrow makes a very good simple patera, plain brass or tin-lined. Deepeeka's metal canteen/flask is good, though it is best to line it with bees wax or brewer's pitch and the stopper probably needs to be modified. Their newer patera is acceptable, with a good bowl though the decoration on the handle is raised instead of incised (their old patera is useless!). They also have a reasonable bucket or situla. Roman marching rations included foods which could be preserved: hardtack (called bucellatum) or flour or unground wheat, bacon or salted meat, dried lentils, etc. Olive oil and garum (fish sauce) were also important, and "sour" wine called acetum was the common beverage. In garrison, there was fresh bread, meat, and vegetables, along with fruit and almost anything else that was edible. A surviving recipe for hardtack/bucellatum is essentially the same as 18th century hardtack. I've made both, and keep some (several years old) in my satchel. Mix it all up. Start adding water, a little at a time, to make a stiff dough. Form it into "pancakes" about 4" wide on ungreased cookie sheets, poke some holes in them, and put in oven at 250 degrees. After 2 hours, pry one off the pan and break in half--if it is hard and dry all the way through, it's done, but if not, give it another hour. Or simply turn the oven off and go to bed, they'll be done in the morning. Throw it all into a dirty linen bag and it will last forever (unless you are hungry enough to eat it!). Note that giving samples of food to the public may be a violation of local health laws, so please refrain from doing so without authorization. It is usually effective enough to eat it yourself!